Okay, sir – you should have received your copy of the Ocean Rider seahorse training manual by now. 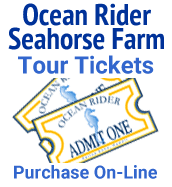 Just let me know when you have completed the entire training manual and I will be happy to put your certification through right away so that you will be authorized to order Ocean Rider seahorses. Best wishes with all your fishes, Mr. Stanfel. Okay, Carlos, I will go ahead and send you the entire Ocean Rider Seahorse Training Course – all 10 lessons together in one file – in PDF format as an attachment to this e-mail. You can then download the attachment, save it on your computer, and read through the 10 lessons at your leisure, taking all of the time you need to go over the information and absorb the material. As you do so, it will be your job to contact me via e-mail whenever you have any questions or concerns about the material in the lessons, and I will then do my very best to answer all of your questions and clarify everything for you. All we ask in return is that you stick with the highly domesticated Ocean Rider Mustangs or Sunbursts when you are ready to stock your tank, Carlos. As you know, Mustangs and Sunbursts are the perfect ponies for beginners. They are hardy, highly adaptable, easy to feed, and perfectly adapted for aquarium life — the world’s only High-Health seahorses, guaranteed to be free of specific pathogens and parasites. Be sure to save the PDF file with the seahorse training lessons on your computer for future reference, Carlos. It includes a detailed table of contents with page numbers, so that you can quickly locate the material or section you would like to go back and review at any time. Just remember that the lessons are for your eyes only, Carlos, with the obvious exception of any immediate family members who may be helping you with the aquarium or the care of the seahorses. Please don’t share the PDF file with the complete training program or the individual lessons with any other hobbyists or individuals without first obtaining my expressed permission to do so. Thanks for your cooperation! In the meantime, I should advise you that adult seahorses are much too large to have any interest in rotifers, which are only suitable for feeding newborn seahorses. The same thing is true for newly hatched brine shrimp (Artemia), Mr. Swartz. However, adult brine shrimp that have been gut loaded to enrich their nutritional value are good food source for seahorses and an excellent way to provide them with an occasional live treat. But you should plan on using frozen Mysis as the staple, everyday diet for your adult seahorses, sir. Best wishes with all your fishes, Carlos! The only thing i have in it is a small red firefish to cycle the tank i plan on getting a ruby red dragonet and a cleaner shrimp to eat leftover food and of corse the pair of seahorses. I am 13 though so i will most likely only be able to pay less than 100$ for the pair so i was looking at the tiger tail seahorses. and it has only been up and running only a week now i only have a hang on back filter now but will have a 30 gallon canister filter soon i will cover the sucker piece with a large rock so he ponys dont get sucked in. I would like to take your training course please thank you. I am very interested in getting started on the certification training. I am new to sea horses but have a 220 reef tank up and running with various soft corals and&nbsp;fish, including a mated pair of gold banded maroon clowns, Christmas wrath, green mandarin, yellow tang, fox face and a gobe.&nbsp; Various&nbsp;invertebrates including a large&nbsp;carpet&nbsp;anemone and a large cleanup crew. This tank has been up and running for 9 months. A 28-gallon biocube can make a fine seahorse habitat if it is properly equipped and aquascaped, Sasha. A 3 in one filtration system can provide efficient biological filtration and compact florescent lighting is generally a good choice for a seahorse setup. I think the primary biofilter will provide the aquarium with sufficient circulation for your needs without having to employ the powerheads. If you use the powerheads, only one of them will be needed at most, since, with an output of 265 gallons per hour, one of them will turn over the entire volume of the 28-gallon aquarium about 7.5 times per hour, and seahorses do best with a turnover rate of 5-7 times per hour, in my experience. The 3-in-one filtration system will provide pretty fair circulation all by itself, so just one of the powerheads is all you should consider, and you may be just fine without any powerheads at all. To get you started off on the right foot, Sasha, I will send you a complete copy of the Ocean Rider Seahorse Training Manual as an attachment to an e-mail so that you can download it, save it on your computer, and carefully read through the material at your convenience. The seahorse training manual is very comprehensive, consisting of several hundred pages of text with more than 250 full-color illustrations, and it will explain everything you need to know in order to keep Ocean Rider seahorses successfully in a home aquarium. Hi Pete, Hope this note finds you well. My name I Greg Agrusa and I am interested in taking your Sea Horse Certification course. I am an avid reefer and started in the hobby about 6 years ago with a jbj 28 nano cube.I modified the lighting on it to be able to control the LED channels and grow SPS corals. I had great success with that tank and soon outgrew it and upgraded to a 120 gallon with a 40 gallon sump, mixed reef but primarily sps dominant tank.which has been up and running for about 4 years. I recently set up my 28 again and am going to use it to acclimate and train a captive bred pair of mandarins.I figure this should take about 4 to 6 months and after that I plan on leaving it set up and converting it to a seahorse tank. Both tanks are controlled by 2 apex controllers, with the 120 having all the bells and whistles to make it very automated. I grow my own phyto, have a brine shrimp hatching station, a 2.5 gallon amphipod culture, a blackworm culture tank, a QT tank ready to go at a moments notice and 2 hospital tanks that are also ready to go at a moments notice. Very good, sir! If you are able to train a pair of captive-bred-and-raised Mandarins, you should certainly do equally well with seahorses and pipefish. In short, as an experienced marine aquarist, I have no doubt that Ocean Rider’s hardy, adaptable, Highly-Health seahorses will thrive under your diligent, conscientious care. Okay, Mr. Agrusa, I will go ahead and send you the entire Ocean Rider Seahorse Training Course – all 10 lessons together in one file – in PDF format as an attachment to this e-mail. You can then download the attachment, save it on your computer, and read through the 10 lessons at your leisure, taking all of the time you need to go over the information and absorb the material. As you do so, it will be your job to contact me via e-mail whenever you have any questions or concerns about the material in the lessons, and I will then do my very best to answer all of your questions and clarify everything for you. All we ask in return is that you stick with the highly domesticated Ocean Rider Mustangs or Sunbursts when you are ready to stock your tank, Greg. As you know, Mustangs and Sunbursts are the perfect ponies for beginners. They are hardy, highly adaptable, easy to feed, and perfectly adapted for aquarium life — the world’s only High-Health seahorses, guaranteed to be free of specific pathogens and parasites. Be sure to save the PDF file with the seahorse training lessons on your computer for future reference, Greg. It includes a detailed table of contents with page numbers, so that you can quickly locate the material or section you would like to go back and review at any time. Just remember that the lessons are for your eyes only, Mr. Agrusa, with the obvious exception of any immediate family members who may be helping you with the aquarium or the care of the seahorses. Please don’t share the PDF file with the complete training program or the individual lessons with any other hobbyists or individuals without first obtaining my expressed permission to do so. Thanks for your cooperation! Best wishes with all your fishes, Greg! I’ve sent an email to you about this. I hope to hear from you soon. I just sent you an email with a request for the training course. I look forward to hearing from you. I have had a salt water tank most of my life, but this is my first time with sea horses. I am looking forward to receiving the training program. I really appreciate you sharing you knowledge with us. Excellent! With your background and experience as an accomplice reefkeeper, I have no doubt that you will be equally successful with Ocean Rider Mustangs and Sunbursts (Hippocampus erectus), Stephanie. One of the keys to keeping seahorses healthy and happy in a small, close system aquarium is to maintain optimum water quality at all times, which is something I have found that reefers understand very well and are accustomed to providing for their aquariums. Okay, Stephanie, I will go ahead and send you the entire Ocean Rider Seahorse Training Manual – all 10 lessons together in one file – in PDF format as an attachment to this e-mail. You can then download the attachment, save it on your computer, and read through the 10 lessons at your leisure, taking all of the time you need to go over the information and absorb the material. As you do so, it will be your job to contact me via e-mail whenever you have any questions or concerns about the material in the lessons, and I will then do my very best to answer all of your questions and clarify everything for you. All we ask in return is that you stick with the highly domesticated Ocean Rider Mustangs or Sunbursts when you are ready to stock your tank, Stephanie. As you know, Mustangs and Sunbursts are the perfect ponies for beginners. They are hardy, highly adaptable, easy to feed, and perfectly adapted for aquarium life — the world’s only High-Health seahorses, guaranteed to be free of specific pathogens and parasites. The seahorse training manual is very comprehensive, consisting of several hundred pages of text with more than 250 full-color illustrations, and it will explain everything you need to know in order to keep Ocean Rider seahorses successfully in a home aquarium. Be sure to save the PDF file with the seahorse training lessons on your computer for future reference, Stephanie. It includes a detailed table of contents with page numbers, so that you can quickly locate the material or section you would like to go back and review at any time. Just remember that the lessons are for your eyes only, Stephanie, with the obvious exception of any immediate family members who may be helping you with the aquarium or the care of the seahorses. Please don’t share the PDF file with the complete training program or the individual lessons with any other hobbyists or individuals without first obtaining my expressed permission to do so. Thanks for your cooperation! Best wishes with all your fishes, Stephanie! Sent an email yesterday, I have a 224 gallon tenecor tank with 80 gal. custom sump, apex controller, deltec skimmer, radions, sps mixed reef. I’ve had saltwater since early 1990’s. Your copy of the Ocean Rider Seahorse Training Manual is on the way and you will probably have already received it by the time you read this message. The seahorse training manual is very comprehensive, consisting of several hundred pages of text with more than 250 full-color illustrations, and it will explain everything you need to know to keep Ocean Rider seahorses successfully in a home aquarium. The Ocean Rider banded pipefish (Doryrhamphus dactyliophorus) will not outcompete the seahorses at feeding time, and the pipes make great companions for Mustangs and Sunbursts. Pete – I have sent you an email to request to take the seahorse course. I look forward to your reply! Pete, I would really like to take the training program. My husband and I have kept saltwater aquariums in the past and love it, but I have always wanted my own seahorse tank. We are finally going to get my tank this week and start the setup and cycle so I can get my ponies in a couple of months.